Andrew Murray explains how you can overcome doubts and receive the full measureof faith that God has for in store you. 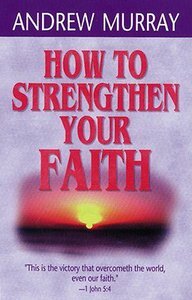 About "How to Strengthen Your Faith"
"From the Publisher" No matter where you are in your walk of faith, this book will take you farther along the way. Discover a new, stronger faith as the Holy Spirit works in your heart to erase all doubts. How can you be sure that you have faith? Andrew Murray explains how to develop your faith until you have erased all your doubts. Then you will be able to receive the full measure of faith that God has for you. Find comfort in God's presence, experience the living power of God's Word, and obtain the riches of all God's promises. No matter where you are in your walk of faith, this book will take you farther along the way to God. Discover a new, stronger faith as the Holy Spirit works in your heart!